The Xiaomi Mi Max is the latest flagship phone from the Chinese manufacturer and has just been launched. Even though the device is not available for sale just yet, the images of the Mi Max and its variants have been surfacing across the internet. 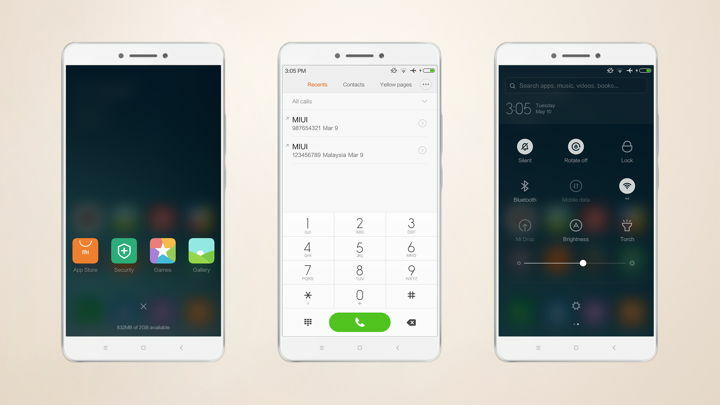 The smartphone has gained quite some popularity across the globe not just for its stunning looks, but also for the latest MIUI 8 ROM based on the Android 6.0 Marshmallow version that comes out of the box. Earlier we brought to you the features and looks of the MIUI 8 ROM that exhibits revamped notification panel, some effects, and more. However, now the MIUI developers have revealed the Xiaomi Mi stock wallpapers and themes for us which is claimed to be based on the latest MIUI 8 stock firmware. You can also take a look at the specification of the Xiaomi Mi Max from below. Moving to our main topic, as the MIUI 8 Beta ROM is under testing, the developers have released the stock Xiaomi Mi Max default themes and stock wallpapers for rest of the Xiaomi devices. As the Mi Max comes with the MIUI 8 ROM, these themes will give you the feel of the upcoming Xiaomi ROM. The themes come in light as well as dark versions. You can test the new user interface and feel the upcoming Marshmallow ROM. Also, with the stock wallpapers and themes, you can turn your Android device into the Mi Max. So hit the download section below and grab the wallpapers and themes for your Xiaomi device. How to Install Mi Max MIUI 8 Theme on Xiaomi? Download the themes from above. launch a file manager and open the MIUI folder. Now, open the Themes folder and paste the Mi Max themes there. Open the Themes application from app drawer or settings>themes. Choose offline option. Select the Android N theme and apply. Now reboot and enjoy MIUI 8. For more Xiaomi Mi Max screen shots and images, visit our Pinterest Account.